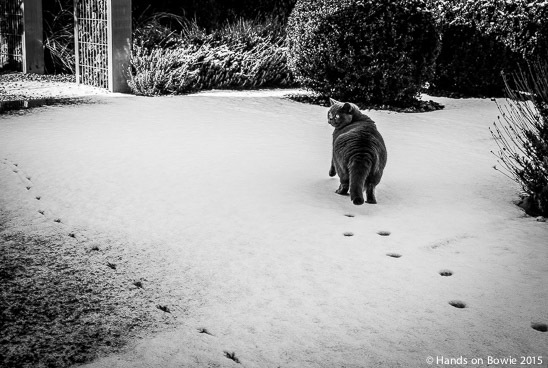 Walking in the snow. Following Mr. Bowie’s ecological footprints wil guide me home and ignite my bones. Giant steps are what he takes. Paws they hardly touch the ground. I hope my legs don’t break. Enjoy this cold day, my friends, wherever you are. Peace, love and understanding. Checkin’ out to see it’s safe outside. Snow! The horror… the horror! This morning, a cold snap resulted in several disruptions on the roads and rail way networks in this part of the world. I had to drive through the snow to see if my Dad was alright. We had lunch together and watched Bear Grylls on tv. I picked up some good advice to get back home safe. Dangerous cold, snow, sleet and rain today. No Mr. Bowie, we can’t go outside. It’s even for a furry four-footer way too dangerous. How can I mentally survive winter? Do people really love winter that much? Can humans survive hibernation in good condition? Hmmm. I guess I’ll stick with espresso. 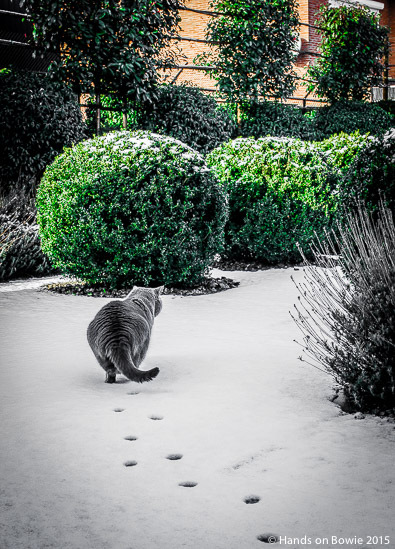 Most cats have to travel a long way to the snow fields. Ensure you have regular breaks to stop, revive and survive. Walking to the snow fields can be tiring because of bad weather, darkness and narrow, winding roads. Watch for signs of travel fatigue and stop and rest as soon as you feel tired, Mr. Bowie. Adjust your walking speed to the weather. Slow down when conditions deteriorate and proceed with caution, particularly in snow or ice conditions. Mantled with snow. 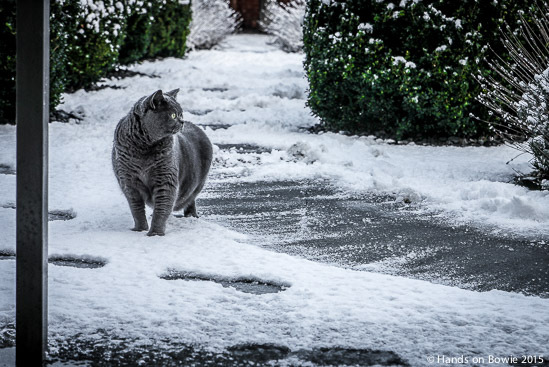 When it snows, you have two choices: shovel or let your cat out for a walk. And have an espresso with marshmallows. Spring, where art thou?